I was delighted to be invited to Alfred’s Pizzeria for a sneak peek at Perth’s newest underground venue in the city. As always Ms. D and Ms. G accompanied me. On arrival the first thing you will see is the original door into the venue. When you go down the short flight of stairs you will be met with a well organised bar with a huge selection of spirits, anything I could think of, was on a shelf somewhere and there’s something for everyone. At the back you will see some Italian pizzeria style tables with the easily recognised red/green and white checkered table cloths. We ordered drinks at the bar, what an amazing daiquiri this was! 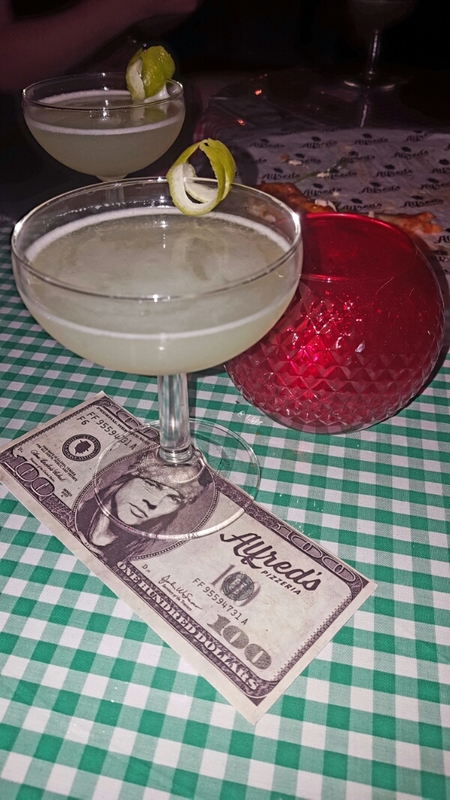 We are all self-proclaimed daiquiri enthusiasts and we all enjoyed the freshness of this one…yum! I found that there were so many things to look at around the venue and couldn’t wait to speak to the owner Michael and find out where he got all of these ideas from. He came together with two others with experience from Sneaky Tony’s and Varnish and this is evident as you look around the venue. 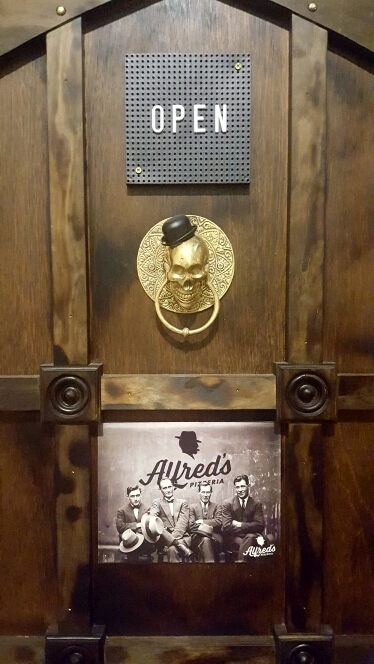 Alfred’s Pizzeria is named after an old American gangster who loved three things; pizza, rock n roll music and good booze, I think this place hits the nail on the head and they really accomplished the initial idea for Alfred’s Pizzeria. The walls were papered in original newspapers from the 24th of November 1963 just before the Kennedy assassination. There were many other things to look at including a $6000 bottle of cognac and through the cracks in the floor at the treasures buried beneath it. 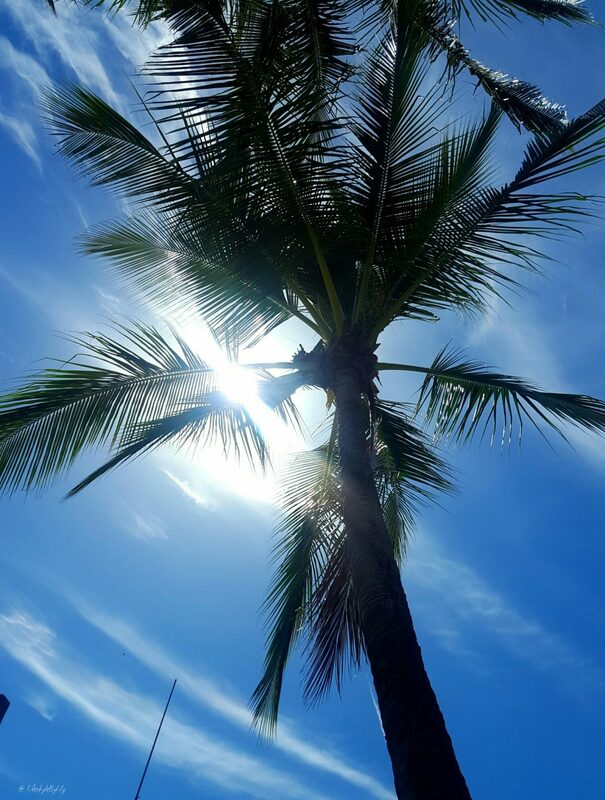 It is truly a sight to behold. While chatting with Michael, two pizzas arrived to our table. We asked where the pizza recipes came from and Michael told us how he met and spent time with god of pizza, Gabriele Bonci, quite the fascinating story! The dough is made and rested for 48 hours before it is used. The pizzas are made by Ben, who has over 20 years of experience, you can tell! What I loved about the pizzas were the lightness of the base and the fluffiness the fresh toppings sat upon. Michael told us that the flour, cheese and tomatoes are sourced from Italy and the other ingredients are locally sourced. They were equally fabulous! Before we left Alfred’s Pizzeria, I went to the toilet. 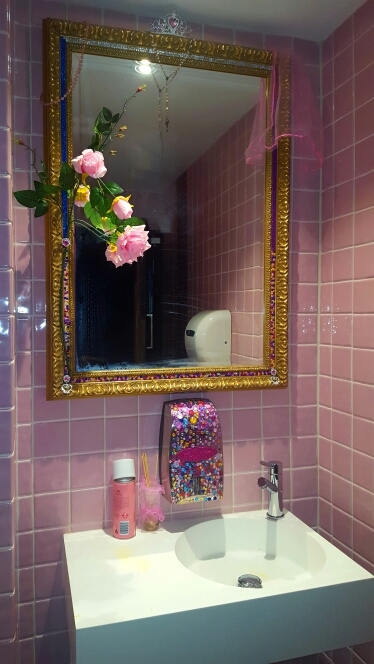 Usually I’m not one for taking pictures of toilets but I’ve never seen so much pink and glitz. If you are a girly girl (unlike me) you might find yourself snapping a few pictures in here. 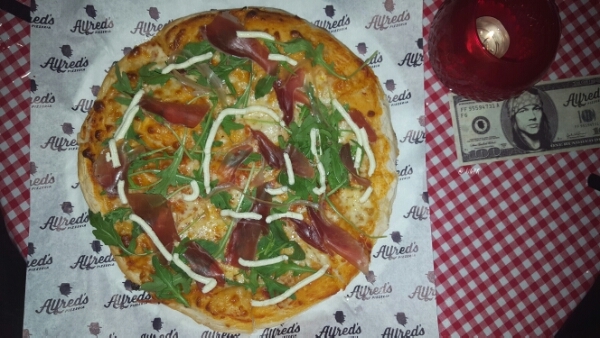 If you would like to see what all of the fuss is about, you can visit Alfred’s Pizzeria from Tuesday 26th of April from 3pm-12am. Pizza is served until 12am, how amazing is that! There are no table reservations or VIPs, anyone and everyone who shares Alfred’s appreciations is welcome. 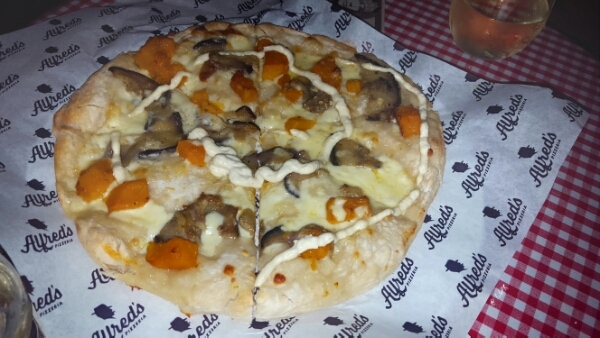 Have you been to Alfred’s Pizzeria? What did you think?